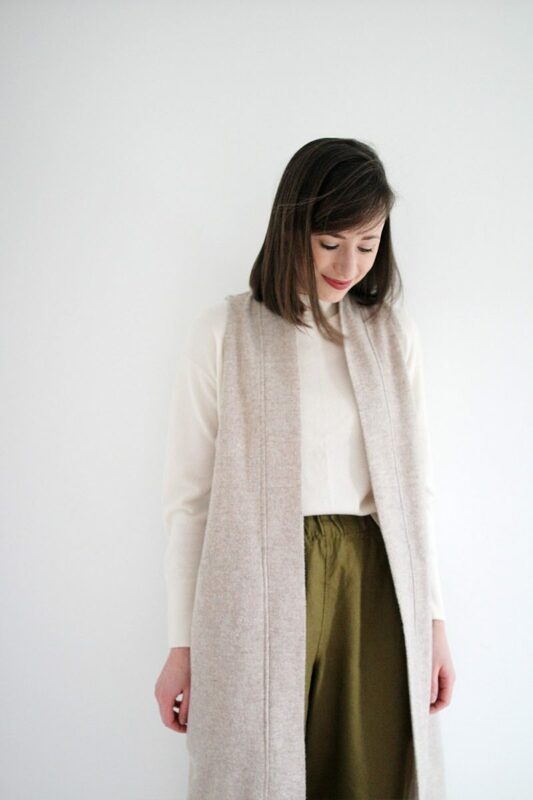 One question I receive a lot around this time of year is how to style linen pieces for cold weather. Linen is a really common fabric within the responsible style realm and it’s one I personally love to wear. It’s known for its breathability, temperature regulating properties, gorgeous movement, comfort and tendency to improve with age. 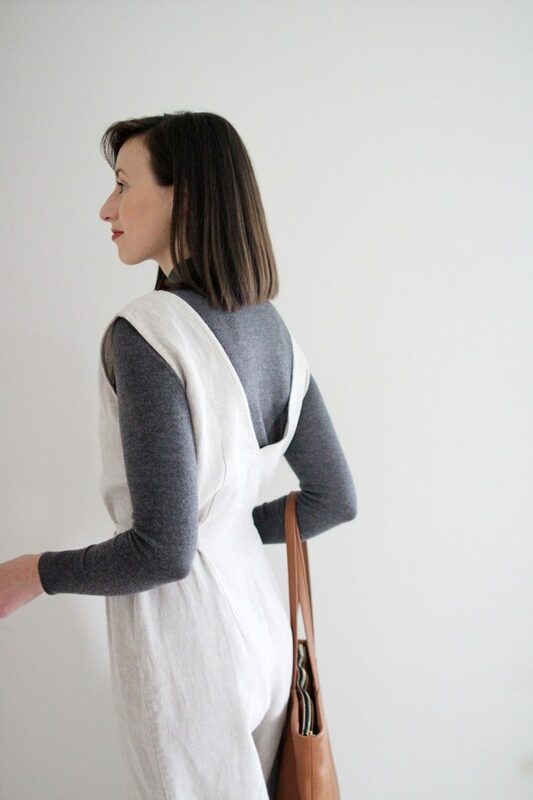 It’s also known primarily as a summer fabric, which I believe is where the hesitation toward linen as a cold weather material stems from rather than its true functional potential. We don’t seem to question silk, cotton or tencel etc. as a wearable winter fabric, yet, I’ve found those to be arguably as temperature dependent as linen. But I get it. If you’re going to invest in a special linen piece you want to, at least conceivably, be able to wear it all year-long. The good news is that you can most certainly can! It just takes a few minor adjustments to make it work. We’ve already had our first major snowfall and negative double-digit temps so I can attest to the fact that these techniques really do work! 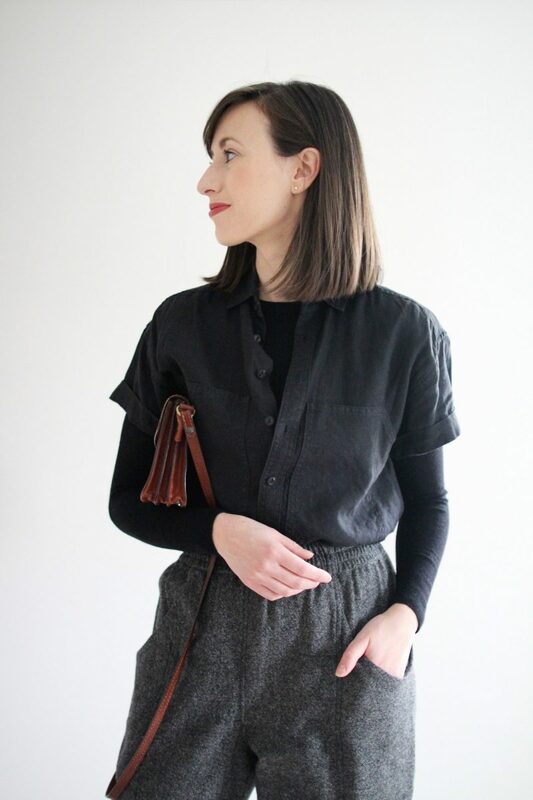 I always have a few long-sleeved, fitted knits in my fall/winter rotation because they’re great for layering and adding warmth without bulk and extra fussing. Black, white and grey are the colours I stick to in order to keep versatility maximized. I like a high crew neck or a turtleneck so that layering different necklines looks as clean as possible. 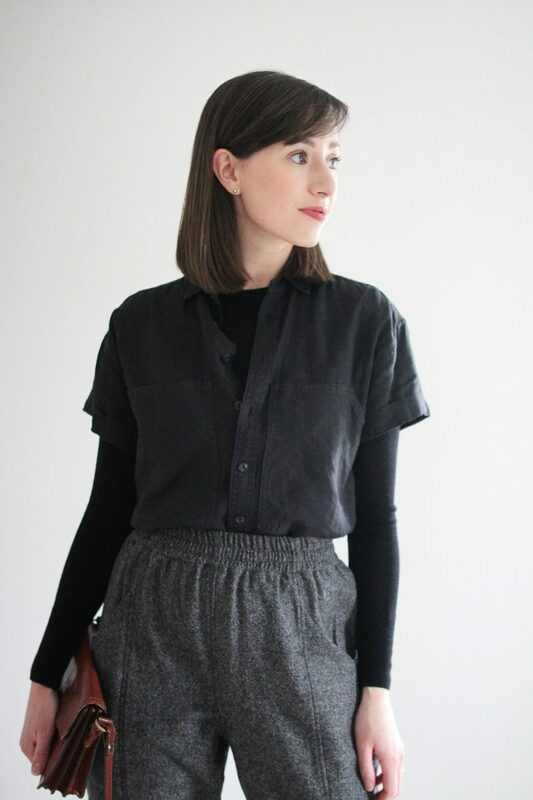 I also recommend tonal layering (ie: black on black) to keep things simple, particularly when combining different sleeve lengths or pieces with details like pockets and buttons, as in this case. Imagine I’d worn a white long sleeve underneath, it could certainly work but wouldn’t feel nearly as streamlined. In this case, I’ve purposely unbuttoned my Philosopher Shirt lower than I normally would. This is an important detail for me because it helps the long sleeve base feel as though it’s part of the look not just a thermal requirement. Keep small elements like this in mind so your layering looks intentional. Power Of My People and Style Bee will be donating 10% of all shirt sales using the code ‘STYLEBEENCC’, this Black Friday through to Cyber Monday to the Nature Conservancy of Canada (NCC). NCC was selected because of our deep appreciation for Canada’s natural splendour and the work NCC does to protect it. Offer valid through Monday November 26. I’ve heard people mention that mixing different seasonal fabrics is a no-no but I simply don’t agree. Just because linen is a ‘summer’ fabric doesn’t mean it can’t be paired with ‘winter’ materials like wool. In fact, I think the textural mix is awesome and actually enhances the cozy feel of the look overall. Linen also works brilliantly with crepe silk, raw silk, tencel and cotton too. So I say, mix ’em up to your heart’s content! 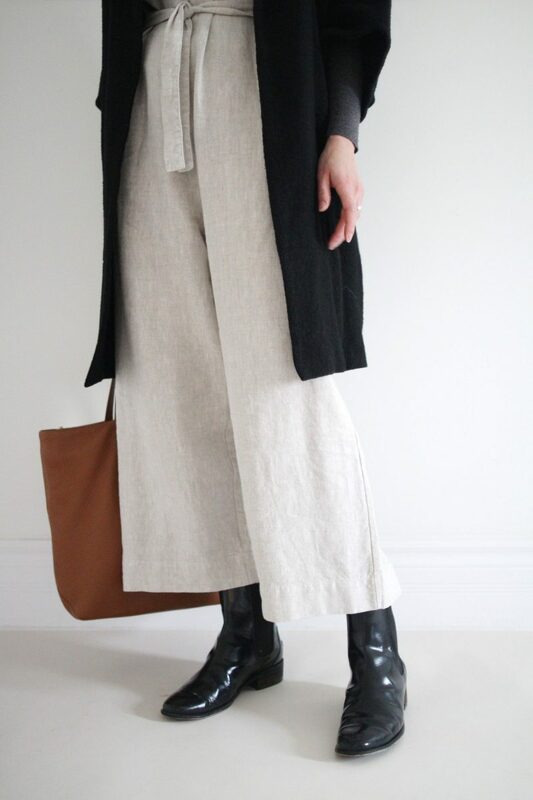 In this look alone I’ve got an alpaca cardigan, marled wool pants, a linen shirt, suede boots, a merino wool long sleeve, a cashmere hat and a leather bag. I love this mix of textures so much. If you’re not feeling confident about mixing materials start with a simple palette like black, grey tones and a warm neutral like camel. PHILOSOPHER SHIRT | Power of My People | $165 CAD $132 CAD with ‘STYLEBEENCC’ for 20% Off any full priced shirt. | 10% of all sales between today and Monday will be donated to the Nature Conservancy of Canada. 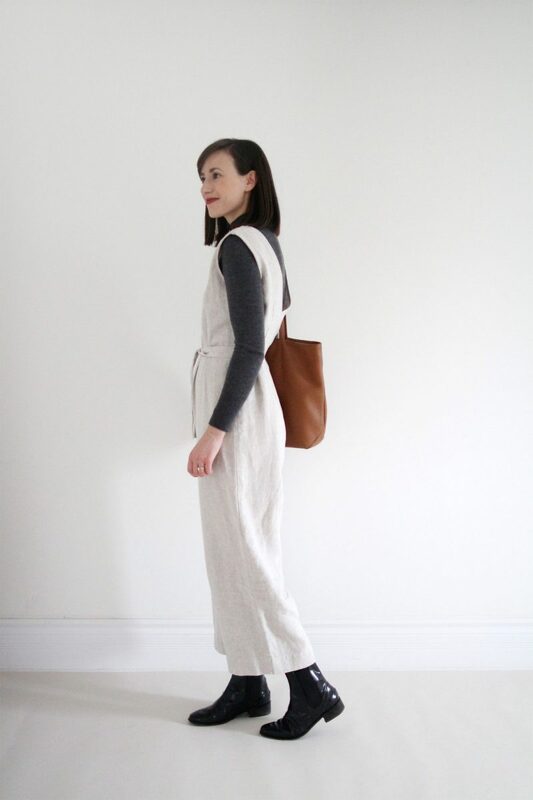 | 100% Linen | Made in Canada. | See my full review here. 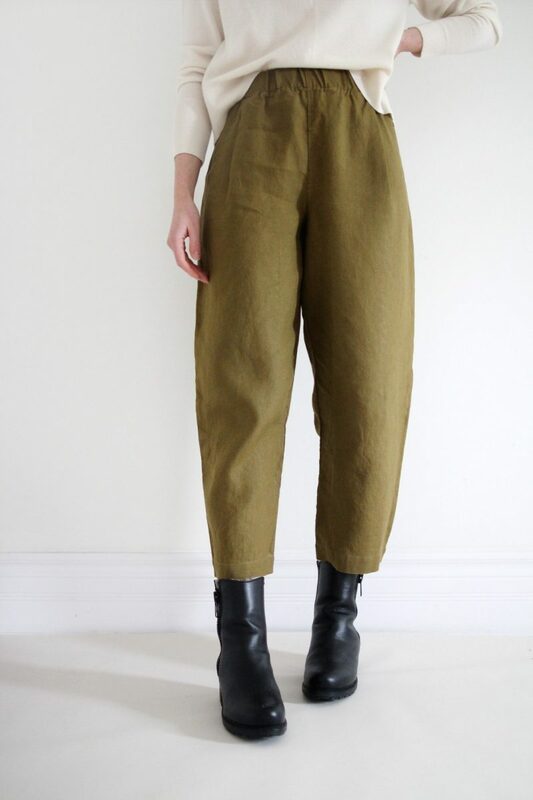 WOOL CLYDE PANT | old Elizabeth Suzann | Same style in canvas here. | Similar option here. | Made in Nashville, TN. CARIE BOOT | Aquatalia | $450 USD $270 USD with 40% Off right now. | Made in Italy | Weatherproof Suede. 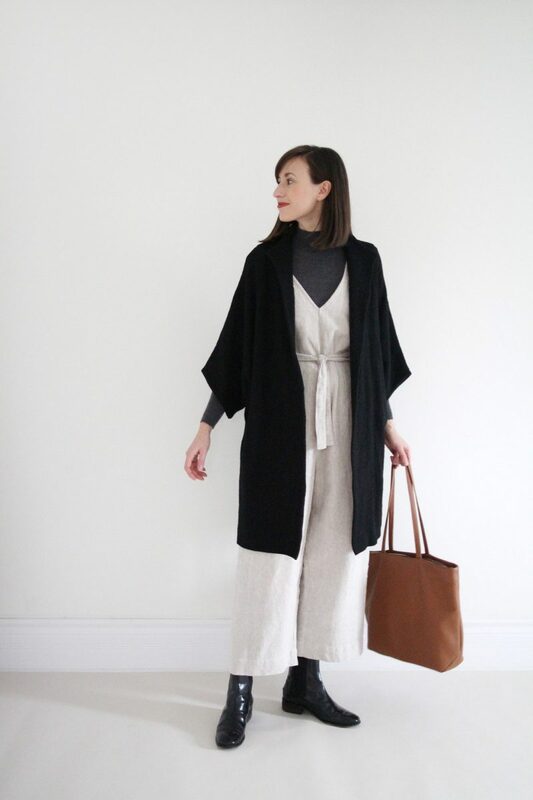 LONG CARDIGAN | old Han Starnes | Linked to similar option. 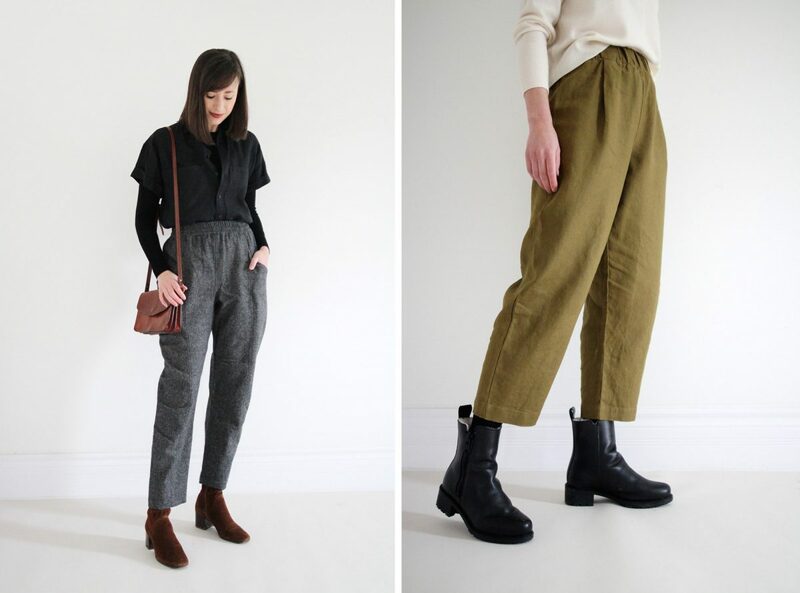 I swear by this trick for wearing linen pants and wide-leg styles in colder temps and it hasn’t failed me yet! Knee socks keep your lower leg cozy and counteract any draft that might find its way up your leg. They don’t even need to be particularly thick to be effective either. I’ve also started wearing them under my slimmer legged pants because they work wonders under those too! Knee socks instead of tights? Yes. The reason being that tights can often add complexity to an outfit and make it uncomfortable. Tights, no matter how well-fitting, always tend to fall down and need adjusting, which isn’t great under pants. The added friction and static build-up when wearing tights under pants is also a nuisance. For me, the marginal added warmth is not worth the hassle. Once you’ve got the lower leg covered (pun intended) you can think about the upper half. I don’t find my upper leg is as bothered by the cold but I still like to keep myself insulated as best I can. 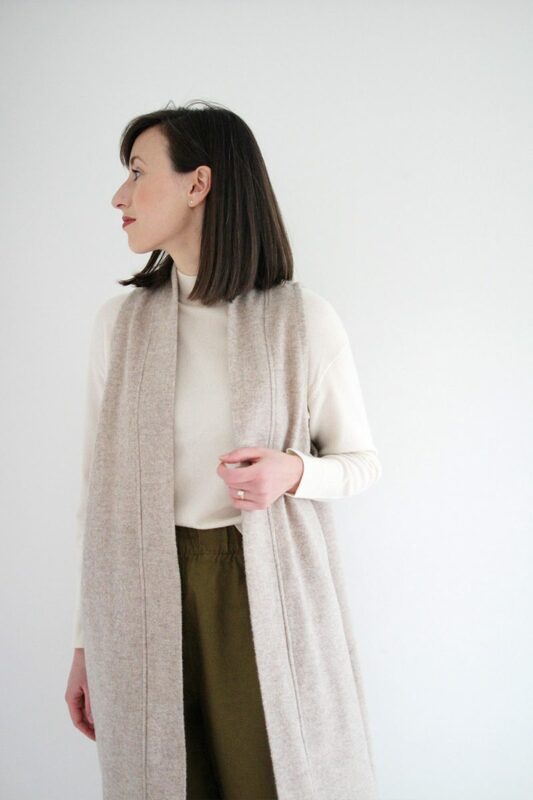 Duster vests come in very handy for this purpose as they can be worn inside a cold office or home and then slid under a wool coat when you’re heading out. Long cardigans, such as the one in my first outfit, also serve a similar purpose. 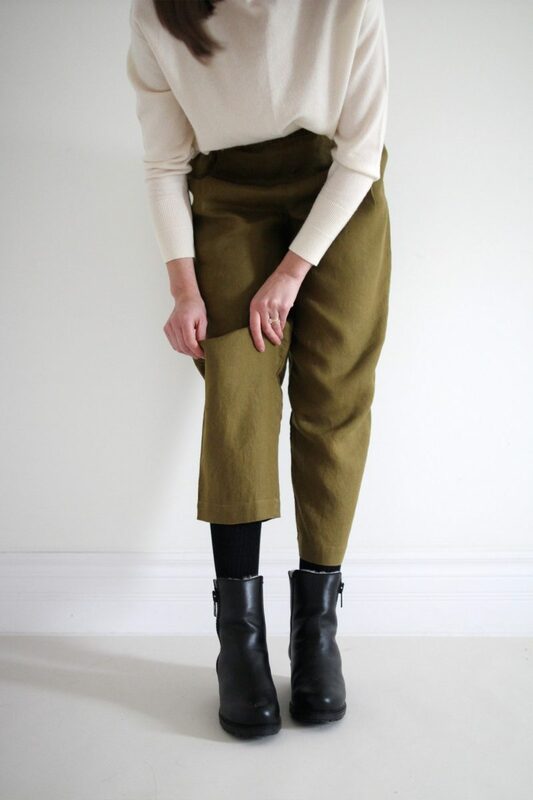 To make a long vest work in this case I’ve tucked my cropped cashmere sweater into my pants to keep the waist-line visible, this is my favourite leg lengthening trick. From there I’ve chosen an ankle boot that meets the bottom of my pants so there is no leg showing to break up the line. Then I’m mixing tasty neutrals like oatmeal and olive together with classics like black, ivory and camel for a colour palette that’s both comforting and fresh. 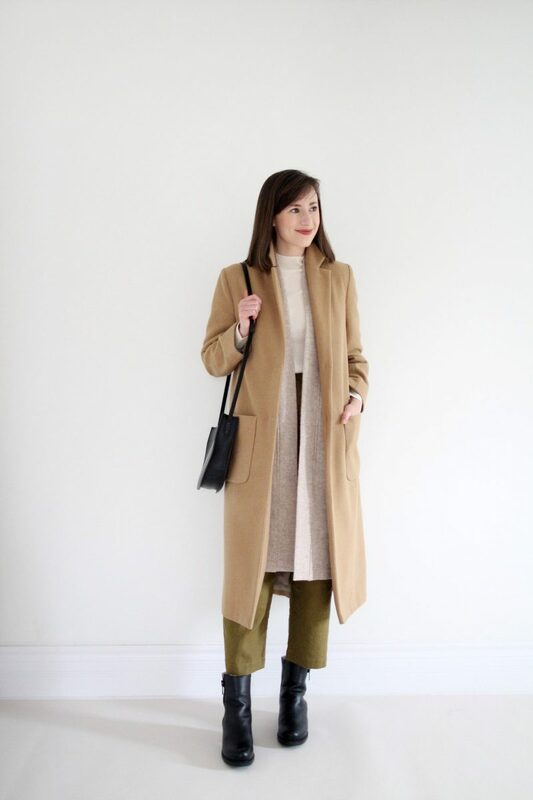 I’m also kind of loving how these sturdy winter boots add a utilitarian vibe to all these soft pieces. Which leads me to my next tip in Look 3! 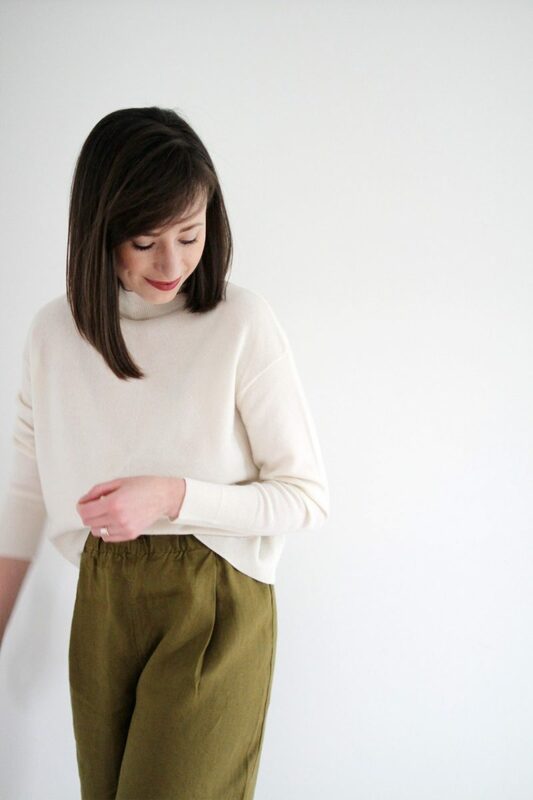 Sidenote: This post isn’t about the Andy Trouser but can we take a brief moment to appreciate this shape? GAH! I’ll share my thoughts on these another time don’t worry. 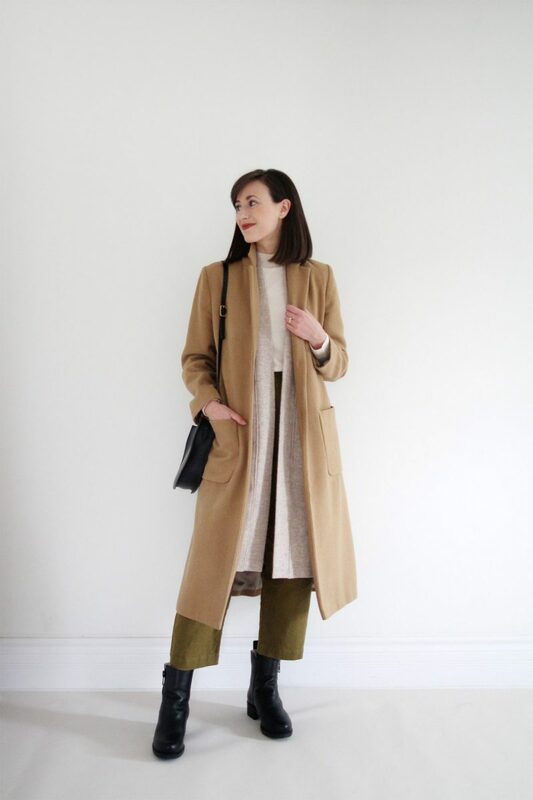 CAMEL COAT | old Marvin Browne | Linked to similar. BLACK BAG | sold out The Stowe | Linked to similar. In Ontario the temps are officially below bare ankle territory at this point and I’ve been reminded of why I have so many tall ankle boot options. 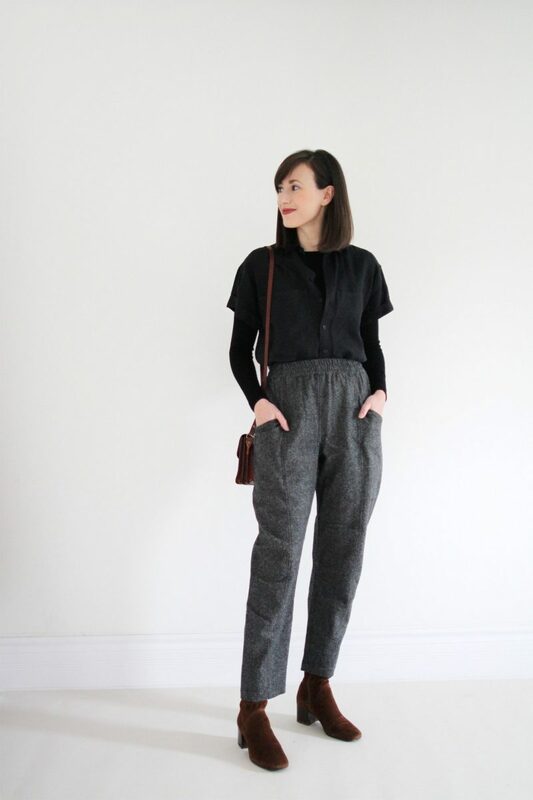 When it comes to cropped length pants (which I seem to have almost exclusively now) they come in very handy. 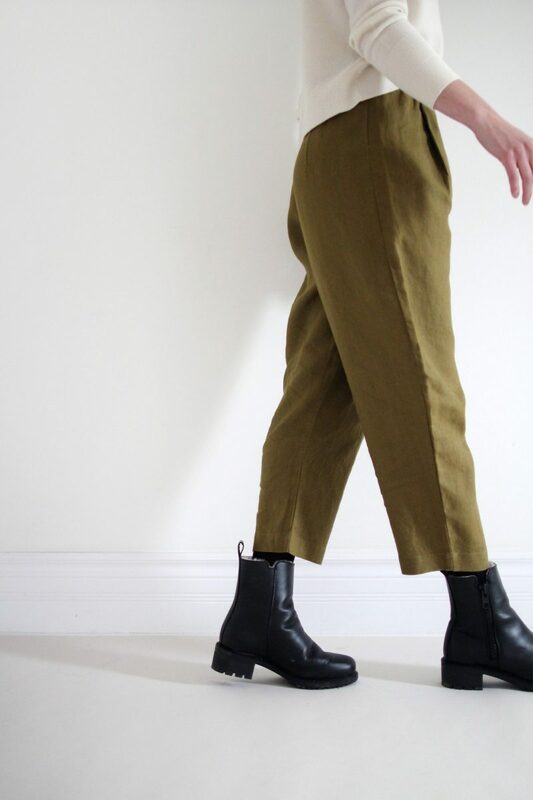 I’m really glad that there are so many tall shaft ankle boot styles available right now because they really are the best way to make cropped inseams practical in cold weather. I like my boots to come up above my ankle by several inches in order for them to at least meet the bottom hem of my pants, or ideally, for there to be some overlap. This is usually between 4 and 8 inches. Look #1 and this outfit show what a bit of overlap looks like and Look #2 shows what it looks like when the inseam ends at the top of the boot. This paired with knee socks really helps to keep out the winter chill. This one is less of a practical tip and more of a theoretical one. We tend to categorize pieces in our closet by season, especially when we reside somewhere that has distinct weather changes. I know I personally had a habit of doing this but once I began blurring those lines a little bit I started seeing how items could work beyond the temperatures I’d originally intended to wear them in. So give yourself permission to ignore the season an item might have been marketed for or purchased in and see if you can’t push its boundaries a little bit. 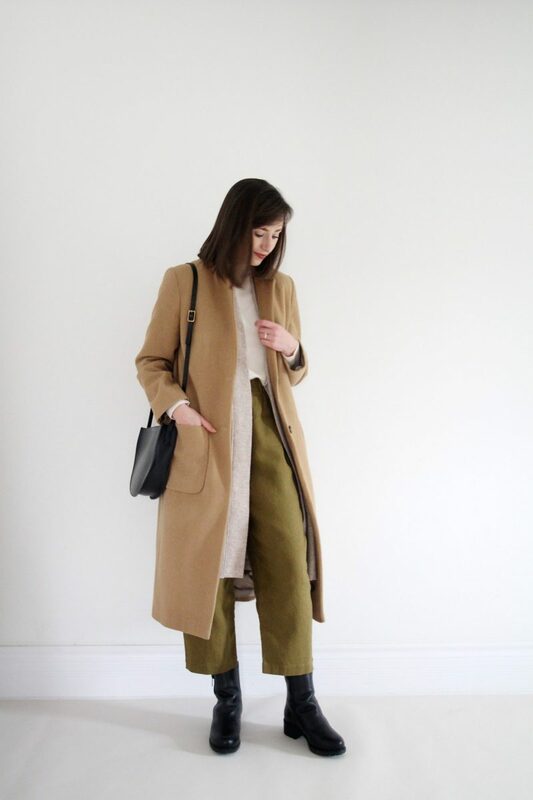 Get ready to layer up, mix textures, add cozy footwear, pile on the long coats and enjoy wearing your favourite summer styles for a little more of the year! 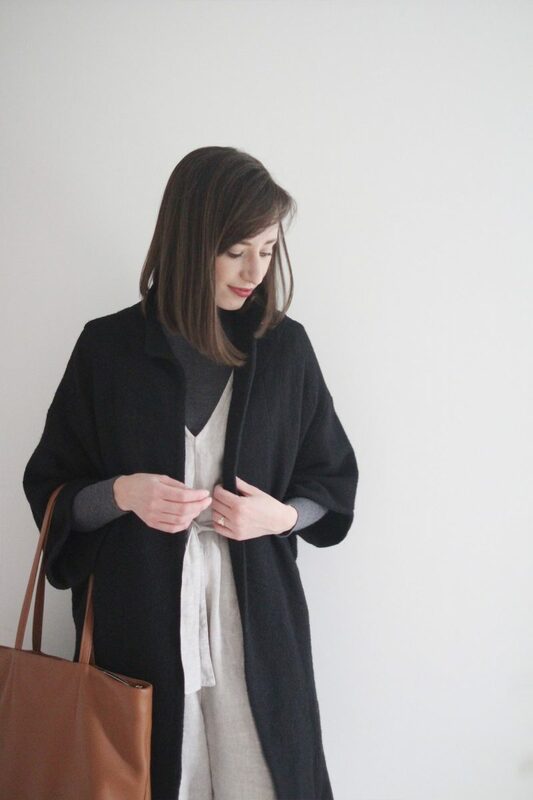 COCOON COAT | old Elizabeth Suzann | Linked to similar. 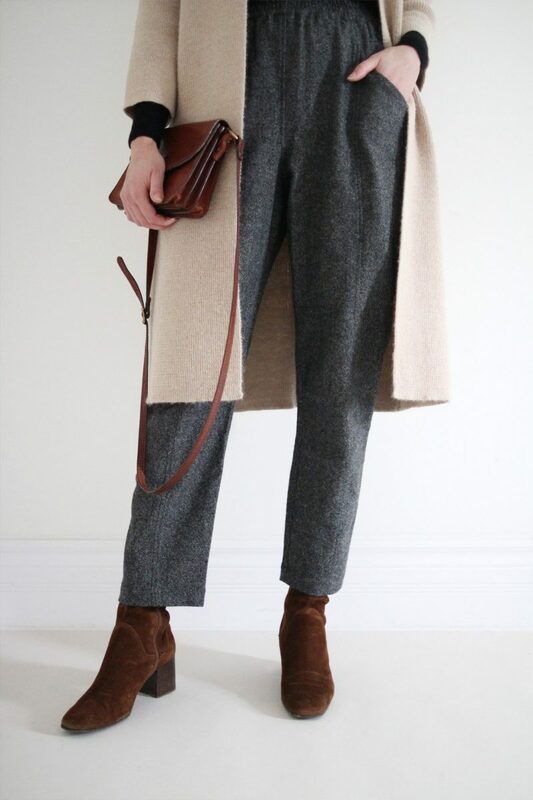 CHELSEA BOOT | old Rachel Comey | Linked to similar. 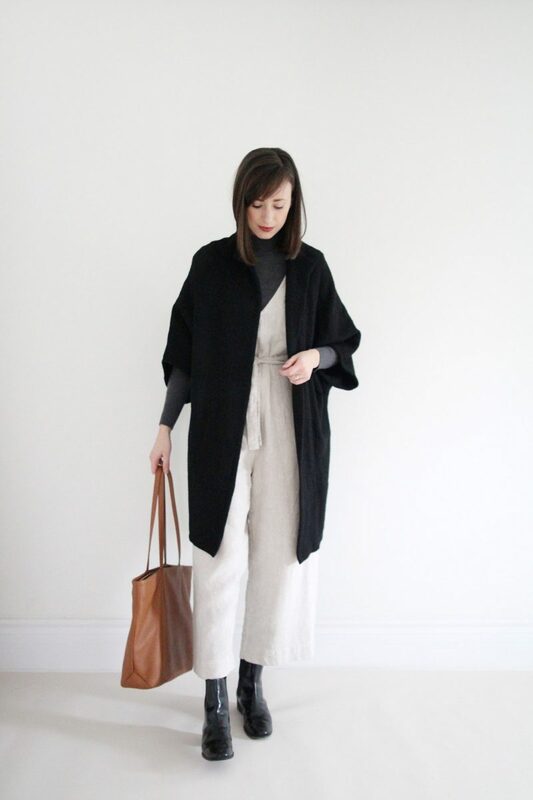 I hope these tips are helpful and inspire you to keep wearing your linen favourites into the winter months! 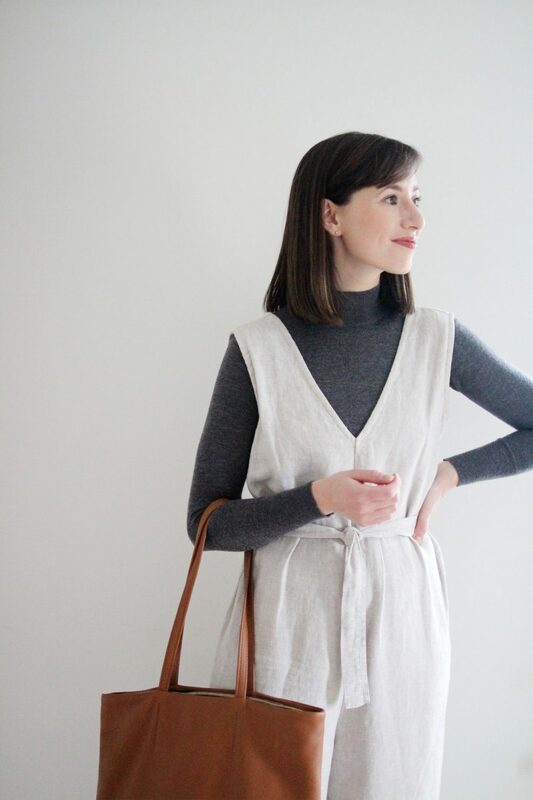 How do you make your linen items or summer styles work for colder temps? What gorgeous clothes! I love linen. Lovely post. I’m looking at my closet in a different way now as the temperatures fall. I’m curious about your linen-care strategies—how you wash it, ironing vs steaming, etc.—as your outfits always look so beautiful. Thanks Laura! I don’t wash my linen too often because I love how soft it gets with wear and I don’t find it needs it. When I do wash it I typically just do cold water delicate and dry on low then I pull it out as soon as I can so it doesn’t crease. I will sometimes iron in between wears (and before I shoot outfits) and store it hanging in my closet so it doesn’t get any wrinkles from being folded. I hope that helps! 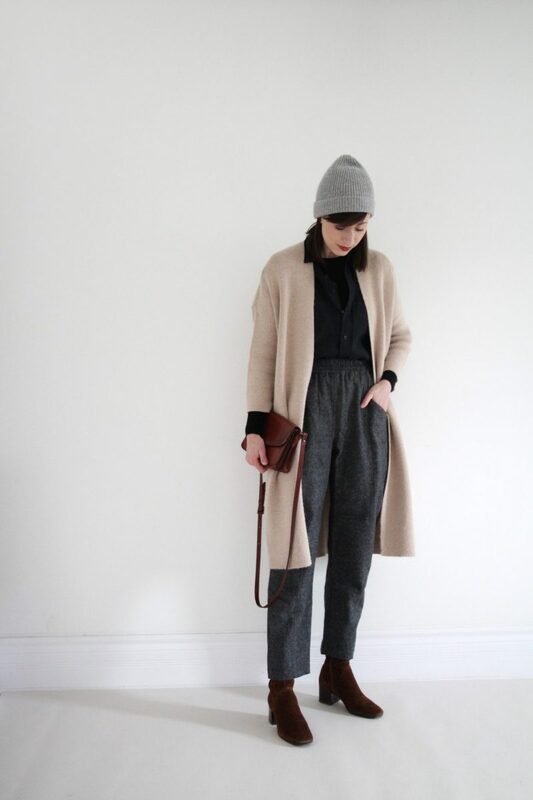 I know this post is about linen, but I have allll the heart-eyes for those wool Clydes. I hope they come back some day! 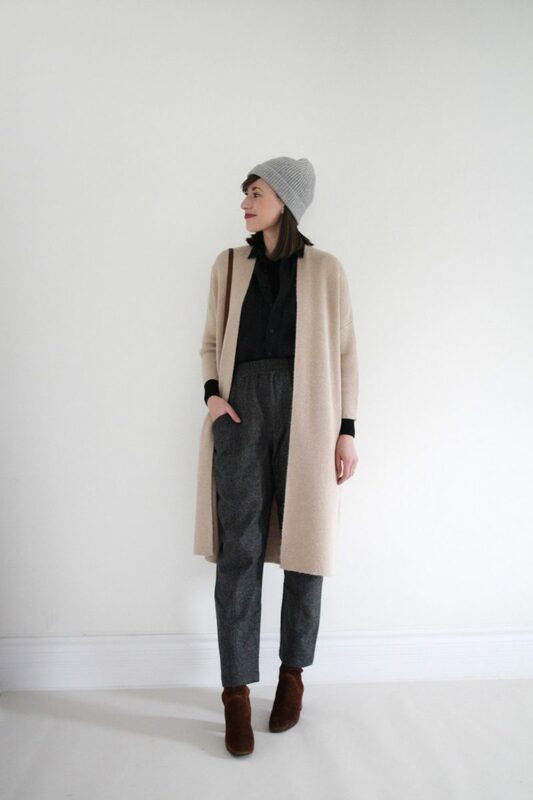 Love the outfits that you have created with the linnen pieces. I never gave layering much thought but this autumn I had bought 2 tops with 3/4 sleeves. Nice for the warm autumn days but as soon as it gets colder I freeze…. Next year I want to buy a blouse or a dress of Pyne & Smith and I do want to wear it the whole year trough. However, is this the most practical thing to do? Not so sure… Linen fabrics tend to retain moisture (you wouldn’t wear them as underlayers); neither are they dense enough to stop wind from blowing through, which makes them not ideal outerwear. But for sure it is a fresh idea and ultimately those outfits look quite unique and awesome! 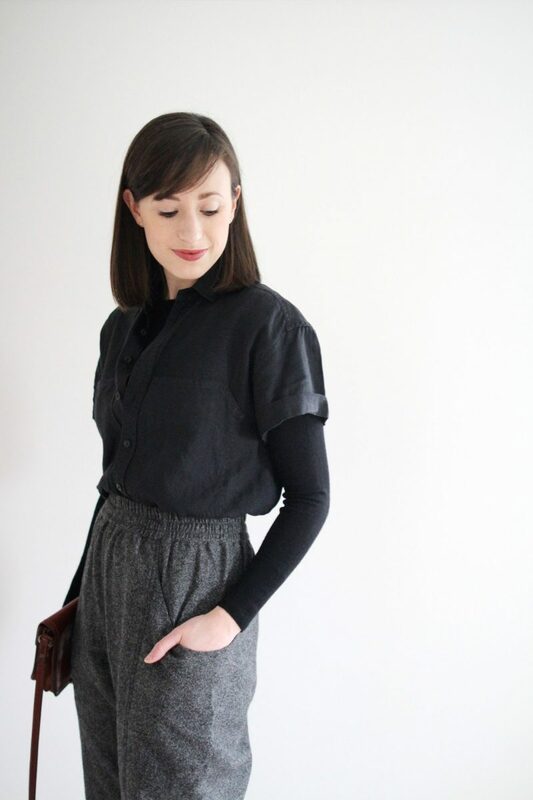 I have a black linen sleeveless jumpsuit that I adore…I wore it all summer long. I dressed it up, dressed it down, wore it work, wore it to yoga, slept in it, the whole shebang! 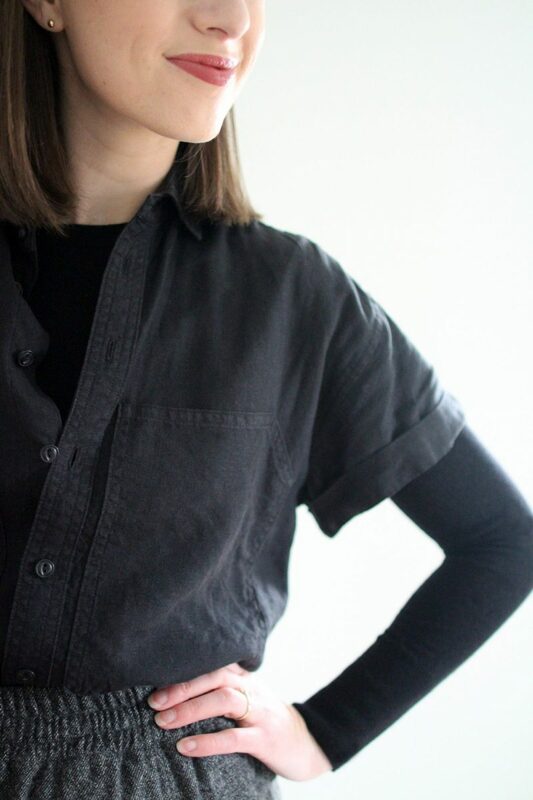 I was sad when the temps started dropping and then I realized all I needed was a black long-sleeve tee to wear under it and I would get to wear it even more! I love when something has such a simple fix. Love all these ideas and I’m definitely going to incorporate them with my linen clothing. Talk to me a little about your Mara Jumpsuit. I see that it is on sale right now as it will be discontinued in January. I would love to order a black linen one, but I have a few questions. I remember when you got yours initially, you were worried about it slipping off the shoulders — have you resolved this? It probably isn’t as bad with a layer underneath it, I assume? Do you find yours long in the body? I am 5’4, pretty short waisted but with long legs in comparison. So I think if I were to order the short version, it will fit in the body better but will the inseam be too short? Gah! ES stuff takes so long to get and being in Canada it is really a pain to return, so I want to get it right! Hey Brenda, Ok, so I tried the S Tall initially but the torso was really long on me and the inseam was a bit long too so I switched to an S Regular and the torso length was better but still a touch long. I had the shoulders taken up about 2 inches each and that helped with the straps slipping and shortened the torso slightly. The straps still have a tendency to slip. When worn on a top like this they’re OK but in the spring I’m going to sew in little clasps to attach to my bra strap so that they stay put. For me that’s not a deal breaker because the double deep V neck is worth it. It’s definitely a tough call on sizing but I’d be leaning towards the short. I’m about 5’7.5 and the regular hits me a couple inches above the ankle. I don’t have super long legs but do find in general I have a short torso to leg ratio, so probably similar proportions to you. I hope that information helps! Thanks for that info Lee! It helped a lot! I’m going to go with the short version in a small and see how that goes! This gives a whole new perspective for linen pants in the cold Minnesota winter! Maybe even my winter white pair…like your jumpsuit! I always feel limited when I want a more flowy-look & feel in the winter. This post is perfect and creative. Thank you! Now to think out of the box with my longer & long-sleeved linen shirts…… what do you think? Thanks for this post Lee. I am from Australia but I’ve just moved to Salzburg for a year’s study and it’s getting cold (for me!). Also I couldn’t bring too many clothes with me so all these tips are really useful, I need to buy myself some knee high socks! Love these looks. Each of them are SO interesting and stylish. Thank you for such a helpful post, Lee. In Chicago, we have insane weather that can go back and forth between warm and cold temperatures, so I no longer separate my summer and winter clothes either and arrange them by color instead. It’s easier to see all the possibilities that way. You’re welcome Carol! Oh I love that idea! I have my hanging closet colour coded but I’m thinking I might try that with my shelves where I store my knits and jeans. Thanks for the tip. Have a great weekend!